sgUSer, 18 Oct 2011you get the same colour for the skin? oh man.... in singapore, the telcos are launching the... moreSame with the Telcos in Msia, black 16GB only for contract. In Msia it's more worth it to buy unlocked. The cyan is nice, magenta looks a bit too striking. sgUser, 18 Oct 2011im about to get n9 in singapore, black is too boring for me. any advice on magenta and cyan... morei got the cyan. it looks extremely nice. its a special kind of blue that just stands out. you will get a free rubber cover inside the box thats the same colour as the phone. it fits extremely well. once you put it on, it doesn't feel like a cover but like a part of the phone. i believe that n9 will hav the biggest number of consumers if launchd in India...and i would b one of them. Any idea when is it launching here? 898sgd for 64gb, 448sgd " "
im about to get n9 in singapore, black is too boring for me. any advice on magenta and cyan? do they look tooo girly or kiddo for a 27 year old guy? AnonD-25668, 18 Oct 2011sorry i wasn't very accurate with my last post. i've bought the 16gb for $649 AUD from an Aust... moreWhere did you order your N9 16GB at $649 AUD? I want to order at the same place like you did but for the 64GB. sorry i wasn't very accurate with my last post. i've bought the 16gb for $649 AUD from an Australian web site and a relative there is sending it to me. This converts to 480 euros. Still not bad. Maybe it costs less in Australia. My last 2 phones were N900 and an unwanted E7 which Nokia gave me under warranty. when it arrives I'll post on here what i think of it. bogdan, 17 Oct 2011Why no Flash ? Non-user-replaceable battery ? No Radio ? Why ? We are cloning Apple ? I h... moreyou can advert android somewhere else. majid, 17 Oct 2011people who say that nokia phones are like no others in terms of design look at the backside of... moreThe N9 and the Optimus 2X look nothing alike from the back. 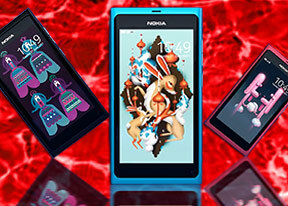 AnonD-17965, 17 Oct 2011hi my friends nokia n9 it is available for sale in romania quite cheap here is the link to t... moreBe aware that the price is without taxes. On top you will have to add 24% VAT which makes the price 533/595 euro. AnonD-12237, 17 Oct 2011i don't know if this us just happening to me but the music player makes the phone reaally lag ... moreNope, no lagging due to music player. How many apps did you have running when you were playing music? There are people reporting lagging due to Facebook, if they have like a few hundred active friends who keep updating, so you can imagine how wild the FB notification will be. i don't know if this us just happening to me but the music player makes the phone reaally lag aand onnce ig lags the music starts stuttering. is this happening to aanyone? i hope they fix it in the update. pat, 17 Oct 2011Can you get the alphanumeric keypad for txting on this phonethere is no alphanumeric typing, there'S is qweryt only. it may seem difficult at firsr for nokia users who are used to the alphanumeric typing but once.you get the hang of it its so.easy.